Two of Winnipeg’s powerhouse DJ units will assemble to embark on another mission in their ongoing quest to propagate the gospel of hip hop culture. 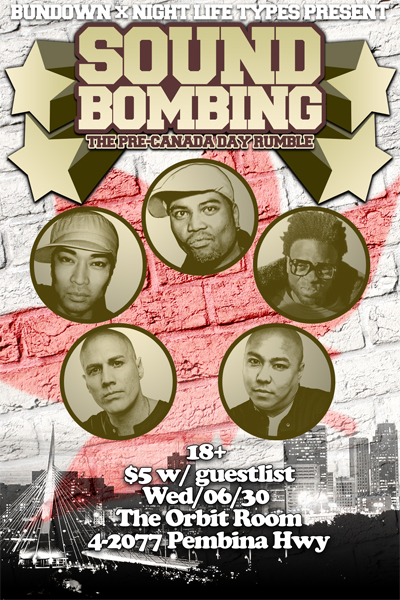 Bundown Sound System and Night Life Types are internationally recognized ambassadors of Winnipeg’s hip hop culture. They have participated in all four elements of the culture over the years and have made their mark by exhibiting an unparalleled passion for hip hop. They have been affiliated since 1997 and first officially worked together on mood ruff‘s No Hooks video. Ofield K and DJ Dow Jones were – obviously – 2/3 of the seminal Winnipeg rap trio. Quadratik and Jay Boogie were members of Flip Roc and Midnight Breakers, the two Winnipeg crews that reintroduced the art of B-Boying to the city since its heyday in the ’80s. All four appeared in the video, only the second from a local rap crew on Muchmusic. Jones was also a fixture on the city’s graf arts scene. Jones, Boogie and D-LO were front and centre when CKUW 95.9FM went to air in 1999 with two of the college station’s most well-known mixshows, Six Degrees and The Lounge. Ofield and Jones also held down popular residencies at Bar Italia and Osborne Freehouse before Jones and D-LO began their well-known residency at Noir Wine Bar. Ofield and Jones held down residencies at Metro Nite Life and Alive In The District, respectively, while Quadratik and Boogie rocked residencies at Bar Italia. D-LO and Boogie also collaborated on their residency at Red Cactus, a venue where Ofield was also a resident DJ. Boogie was also known as Winnipeg’s “hip hop writer” after having launched the city’s first hip hop weekly and monthly columns in Stylus, Perimeter and Uptown, as well as being a contributor to the Winnipeg Free Press that covered hip hop culture and urban music. 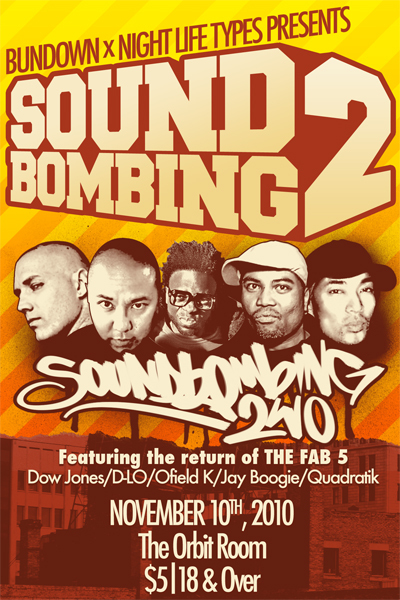 Ofield, Boogie and Quadratik formed Bundown Sound System in 2007, with Jones and D-LO forming Night Life Types not long after. They have since been cornerstones of Winnipeg’s nightlife scene with innovative nightlife concepts and as headliners of some of the city’s biggest shows. For the first time ever, the two sound crews promoted a concept event to celebrate their long relationship with hip hop culture in June of this year. They called it Soundbombing. The response to the collaboration was – pardon the cliche – epic. Once again, Bundown and Night Life Types will rock the foundations of The Orbit Room for what can only be called Soundbombing 2 this Wednesday, November 10 with doors opening at 10:00pm. Admission is $5 and it will be an 18+ event.